We cover all areas of the UK on a regular basis and can group consignments of several different clients together allowing us to offer you a more cost effective solution to your distribution needs. With vehicles ranging from van size through to 44 ton Articulated Lorries we have the flexibility for all our customers needs. 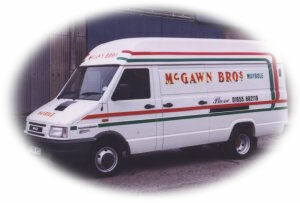 With over 44000 sq ft of warehousing at our disposal, McGawn Bros is able to store our customers product and deliver it direct from our warehouse at the times needed.